~ Search for more books by the same author(s). Sounds nice, but how do we find rest in a 24/7 world? Just as the Hebrews were slaves in Egypt, we have become slaves to technology. Our technological tools allow 24-hour productivity and connectivity, give us more control, and subtlety enslave us to busyness itself. Sabbath is about restraint, about intentionally not doing everything all the time just because we can. Setting aside a day of rest helps us reconnect with our Creator and find the peace of God that passes all understanding. The Sabbath is about letting go of the controls one day a week and letting God be God. So how do we do it? In 24/6, Dr. Matthew Sleeth describes our symptoms, clarifies the signs, diagnoses the illness, and lays out a simple plan for living a healthier, more God-centered life in a digitally-dazed, always-on world. 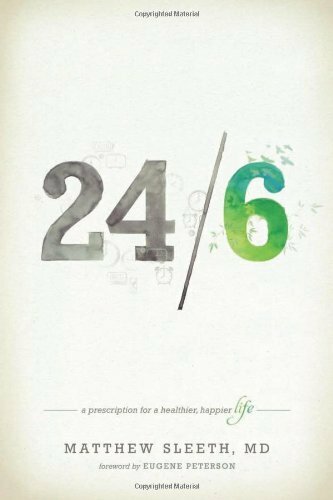 Sleeth shares how his own family was dramatically transformed when it adopted Sabbath practices and helps readers better understand how their own lives can be transformed – physically, emotionally, relationally and spiritually – by adopting the 24/6 lifestyle. It appears that your browser does not support this feature, so instead you can Preview the Book outside of the Transitions website. Please Note: The inclusion of a book here does not equal an endorsement of all aspects of the book. I encourage you to look for the elements within each book that are helpful, while recognizing that you will undoubtedly encounter things which you disagree with (just as I do). Please do your own research regarding any book that interests you in order to determine if it might be a good fit for you. If you are on a mobile connection you may wish to use Coverless Mode instead. ?